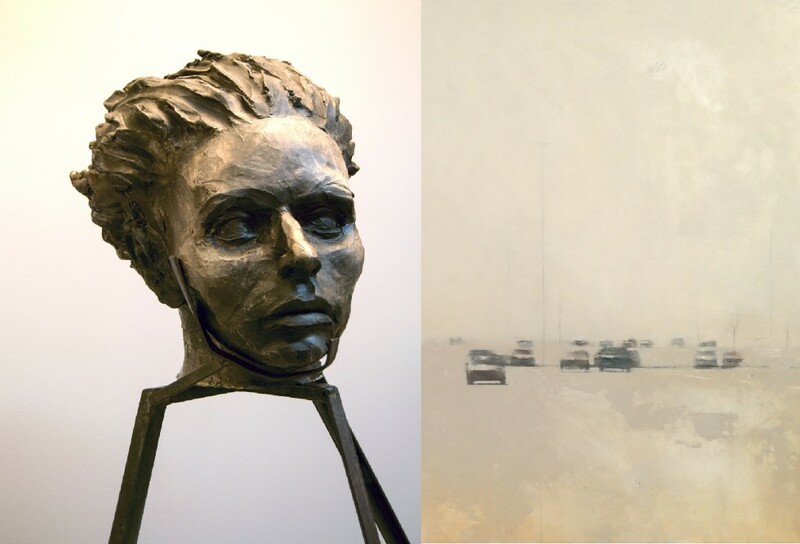 Modified Arts presents a pair of solo exhibitions featuring the emotive yet playful sculpture of Tucson-based artist Joe Dal Pra, and the return of the soft-focus expressionism Sean Thomas. Presented together for the first time, these two artists’ differing styles and media meld in unexpected ways to produce a stark, thoughtful set of shows ready to draw in viewers. Where Dal Pra’s dark, often disembodied sculptures encourage one to focus on what’s present rather than what’s not, Thomas’ mixed-media paintings force the viewer to instead discern what is even being presented, digging through often-dark, flowing color spectra. Thomas frames scenes of urban decay and discarded playthings with sympathetic hues; while the scenes themselves would appear hopeless or isolated in real life, their pointed lack of hard edges leaves the landscapes and objects as places of unexpected beauty. For Dal Pra, monochromatic humans and machines meld into animals, pieces of technology, and plain pieces of metal. The specter of instability looms in all pieces, sometimes indicated through the chaos of war, the prospect of flight, or even a precarious construction. “New Order” represents Joe Dal Pra’s first solo exhibition in nearly six years. The Tucson-based artist’s sculptures and installations feature ceramic and steel processes, allowing for both mechanized and humanized visages to be presented with ease. Over his nearly three-decade career, the artist has showcased work across the US in galleries in Connecticut, DC, San Jose, New York, and more. Currently, Dal Pra is a fulltime art/sculpture faculty member at Pima Community College. Sean Thomas’ “Fragment” represents a continuation of the artist’s body of work from last year’s exhibition at Modified Arts. The encaustic and painted works share the artist’s penchant for building relationships—both between the viewer and piece, and between the object in the piece and its context. Thomas is represented by galleries across the east coast in Boston, Middlebury, VT, and Pawtucket, RI, and is a graduate of Rhode Island School of Design. The artist has been based in Phoenix since 2013.